The Pirates of the Caribbean franchise seemed to have run out of steam somewhat in the third movie, At World’s End. 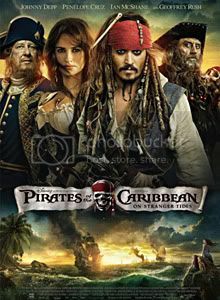 Fortunately, the fourth one and the first without Will Turner (Orlando Bloom) and Elizabeth Swann (Keira Knightley), turned out better than its predecessor. On Stranger Tides starts off with the Spanish discovering the map to the Fountain of Youth, before switching over to London where we find Jack rescuing his former First Mate, Gibbs, who was being charged in court for the crime of being a pirate – specifically, a pirate called Jack Sparrow. Their escape attempt is foiled and good ol’ Captain Sparrow finds himself in an audience with King George, who wants him to guide an expedition to the Fountain of Youth because he cannot allow the Spanish and their “melancholy monarch” to beat him to it. Jack declines and blithely leaps out a window, descending into the 18th century English equivalent of a crazy car chase. He runs into an old flame (Penelope Cruz). One thing leads to another and Jack ends up on the Queen Anne’s Revenge, also known as the ship belonging to the dreaded pirate, Blackbeard (Ian McShane), and Angelica – the aforementioned old flame – turns out to be the First Mate and the daughter of Blackbeard. The Fountain of Youth being the MacGuffin of this story means that Blackbeard is also headed in the direction of the Fountain of Youth as well as the items needed for the “profane ritual” – two silver chalices from the Ponce de Leon’s ship, and a mermaid’s tear. Close behind is Barbossa, who has turned from his pirate ways into a government-approved privateer after losing his right leg and – to Jack’s annoyance – the Black Pearl as well. It’s a tighter story than At World’s End was, which definitely works to the film’s advantage. There being no Will or Elizabeth to share the spotlight, the focus is solely on Jack now and he’s still the same – walking with that peculiar half-drunk and almost effeminite swagger, being arrogant, and dropping humorous lines and sarcastic quips when needed: “You stole me, and now I’m here to take meself back.” “Captain, I wish to report a mutiny – I can name fingers and point names.” “You know that feeling you get when you’re standing in a high place and you have sudden urge to jump? … I don’t have it.” Some people complain that Jack Sparrow has shown no character growth whatsoever. It’s true, he hasn’t grown. But do we really want Jack to become a “better” person? I think part of the crazy kookiness comes from his unpredictability – from not knowing exactly when his “goodness” will set in or when his bad pirate self will prevail. And from here on, there be spoilers. Ooh, and the part where Blackbeard pulled out his sword and said, “Mutineers… HANG.” In terms of scene set up and performance, I really liked it. The line delivery and the preceding shots that set it up – chillingly good. Or so my memory seems to think at the moment. There were a couple of unexpected little twists – Barbossa with a wig and in the Navy uniform along with a peg leg in his first appearance in the movie was such a one. For a moment I actually wondered if that was supposed to be Barbossa or his twin brother. (Maybe other people knew of this beforehand, I didn’t. I don’t recall it in the trailers, and obviously didn’t look close enough at some of the movie posters.) The fact that mermaids turn human – i.e. the tail becomes two legs – when out of water was another. I bet Ariel wishes she knew that before selling her voice to Ursula in exchange for legs. Most unexpected, though, was what the Spanish did when they got to the Fountain of Youth. …They destroyed it. (“Only God can give eternal life, not this pagan water!”) And it really did come as a bit of a shock. I did not see that coming. Music-wise, well, I’m a fan of Hans Zimmer’s music for the Pirates movies so I loved it every time I heard those familiar refrains pop up. There seemed to be less of it this time around though. But I must admit that when the film ended and the theme music came up, I felt the urge the applaud – just for the music. (I didn’t, of course. Shy la. hahah) Very similar to what I feel whenever I hear the Star Wars theme.